Lola speaks! 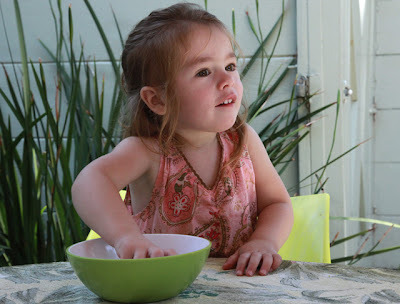 Like Greta Garbo's first anticipated "talkie" after Hollywood's silent movie era, two-and-a-half-year-old Lola's vocal prowess will fascinate and surprise my blog visitors as she name checks the tasty tidbits offered by The 99 Cent Chef. And do I have an eclectic selection of West Coast cuisine for her to nosh on! 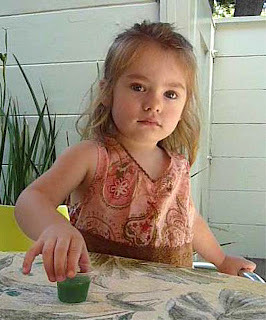 In Lola's First Bite 4.0, she samples Steamed Edamame, a California Sushi Roll, and finally, fresh squeezed Wheatgrass juice-- courtesy of Deb, my filmmaker friend and nutritionally inclined neighbor. 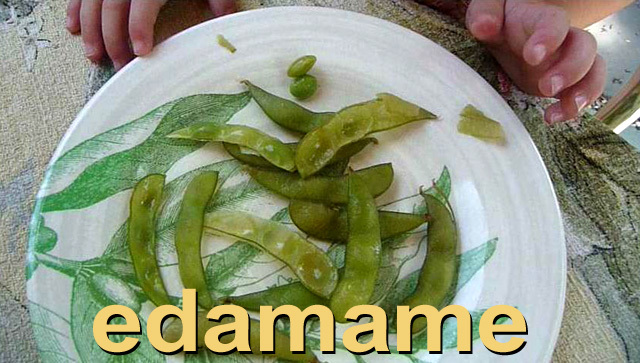 First up is steamed and tender Edamame. 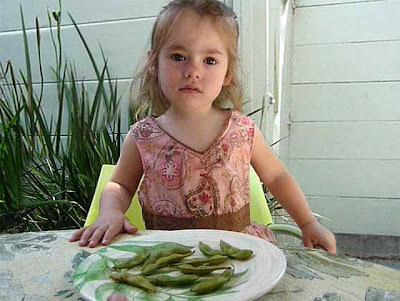 As Lola's mother says "I've been trying to get Lola to eat more greens," and boy does she ever. It takes a couple of tries figuring how to pry them out, but in no time the green pellets are shooting from their pods! She even munches them Japanese style: dipped in soy sauce, with a side of pickled ginger. 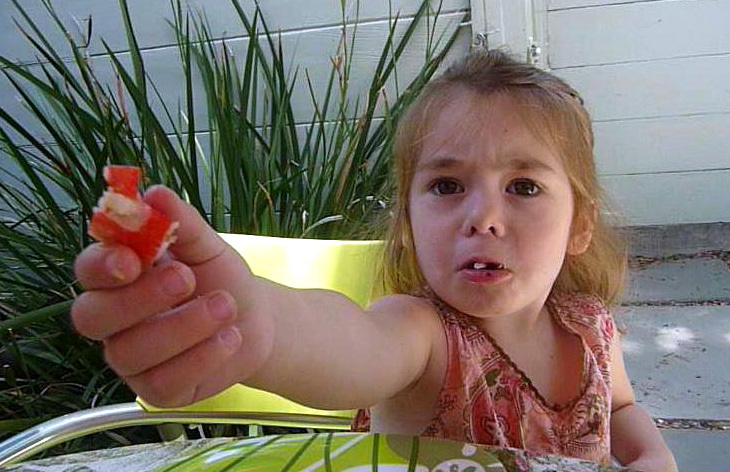 (And her expression when first tasting sour ginger is priceless.) I sometimes find bags of cooked frozen edamame in the deli case of my local 99c only Store, but in this case I got a bag for about $1.29 from Trader Joe's. I have made California Rolls at home with fake crab for way below $1 each. (It's really easy to make and it's in my blog recipe bucket list.) But this time, I got a pre-made sliced sushi roll, again from Trader Joe's for about $4 -- way over my budget, but for Lola, no expense will be spared. 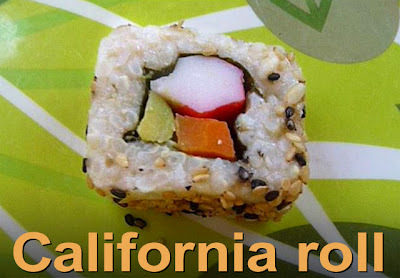 Plus, their California Roll was made with nutritious brown rice. 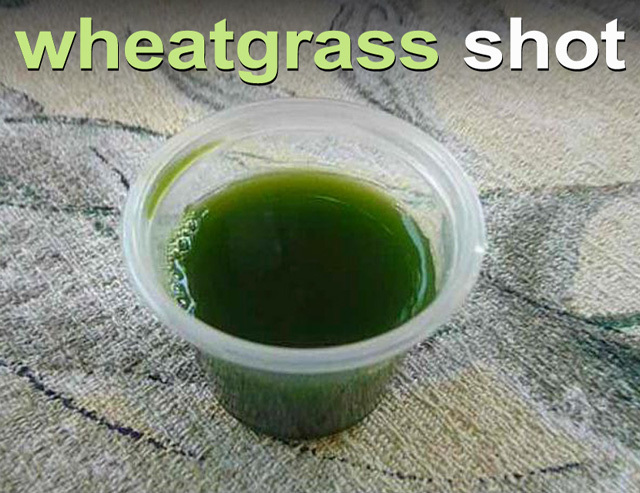 Finally, Lola gets "green nectar of the goddess," a shot glass of Wheatgrass juice, a favorite of health food enthusiasts everywhere. The touted benefits of this elixir, including detoxification and improved digestion, are especially needed after Lola has finished off a bag of Edamame beans and torn apart a California Roll with questionable imitation krab! The Wheatgrass didn't cost a nickle, since my filmmaker neighbor Deb grows flats of the stuff as part of her healthy eating regime. It was freshly squeezed in a hand-cranked juicer, so no heat was generated, and the juice is as raw and nutritious as possible for Lola's developing immune system. Of course all these beneficial maneuvers could be for naught, if this temperamental tot won't bite. Well, you will have to play The 99 Cent Chef's latest video, Lola's First Bite 4.0, to see the delicious denouement to this tale. An extra 99 thanks go to Lola's parents Bob and Lori for allowing the cheapest cinematographer to record Lola's eating exploits. So click below for Lola's latest and cutest video yet! Play it here. Video runs 4 minutes, 7 seconds. And if you can't get enough adorableness, I have 3 more Lola's First Bite videos (just click on a title): Lola's First Bite 1.0, Lola's First Bite 2.0, and Lola's First Birthday Party. 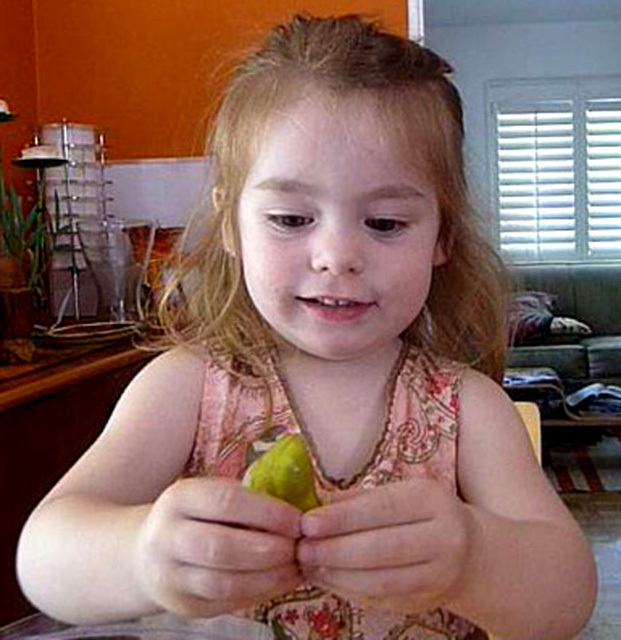 Watching Lola grow up and expand her culinary palate is a joy to watch! Thanks for sharing with us! My goodness - how time flies. She is growing up so fast. Thanks for the video - such a sweetheart.